The last few months have seen a hive of activity at Oranka HQ, as we have been busy working with Hilton Hotels on their 'Flow' project for their Meetings and Events concept. Now officially approved, we can confirm that Oranka's low sugar, high vitamin drinks range has been selected to feature across the UK estate from January. These juices (which have a full range of 21 seasonal flavours) include traditional flavours like orange and apple, but also some more unusual ones such as green tea & lemon, peach, pear and rhubarb. What's more they have only 2% sugar, have added vitamin C and in some cases even have added zinc to boost immune systems. Served in chilled glass dispensers, when you see them all lined up they certainly pack a punch in terms of colours. 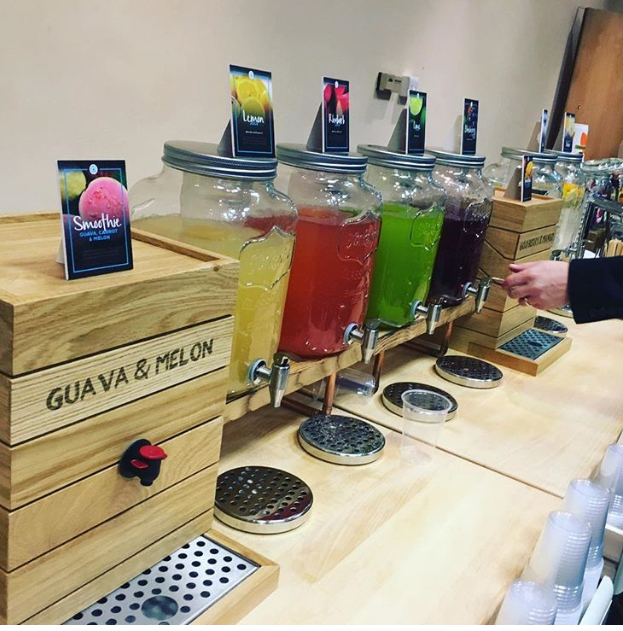 Alongside this tantalising rainbow of drinks, is a range of more premium drinks in Juice Cubes such as Guava and Melon smoothie, leaving meeting and conference guests with the enviable job of trying to choose which drink to have when they break out from their event.